Next up for dissection in the BGS lab is the collection of runs known as the Sprint series. These are outside runs that utilize zone blocking, and they are commonly referred to as "stretch" plays because of the way they stretch a defense horizontally. There are three different runs in this series: one back strongside outside zone, one back weakside outside zone, and a two back strongside outside zone. Need a zone blocking primer? Let a former Irish coach be your tutor. Back in December, Tom Thayer launched an attack on the zone blocking schemes in Charlie Weis's playbook. In many ways, his criticisms were directed toward these Sprint plays, where the linemen move laterally before they start moving downhill. Jay already responded to Thayer's comments, and new offensive line coach Frank Verducci somewhat addressed the question back in the spring when he answered, "Blocking is blocking" and emphasized effort and fundamentals. With this series being the second most popular set of runs (ahead of the Toss, Jab, and Draw), Verducci's coaching will be keenly scrutinized in 2009. The first outside zone play is a one back strongside run. The Irish predominantly run this play with three different personnel groupings: Half (3 WR, 1 TE, 1 HB), Detroit (2 WR, 2 TE, 1 HB), and New York (1 WR, 3 TE, 1 HB). To the right is an example when it's run with two tight ends. As Thayer brought up in his criticisms, you should notice the first step, which is lateral. The easiest way to determine whether the play is an outside zone run is to watch the line move en masse. Sometimes uncovered linemen will pull, and other times they will block down on a defensive tackle, but the lateral movement of the line is too obvious to miss. The following season saw use of the play increase by 50% in Half, due in large part to the injury to John Carlson and the vanilla offense run by the Irish against weak opponents (Navy, Air Force, Army) leading up to the USC game. The Irish ran 14 of the 27 Half carries in 2006 against the service academies. Additionally, Sprint 39 was called more often, as one would expect with the more mobile Dan Santucci playing left guard and freshman Sam Young at right tackle. Not surprisingly, production going left behind Harris and Santucci was phenomenal. The inclusion of 3 Wides was a mid-season experiment against UCLA and Stanford that likely resulted on account of Asaph Schwapp's injury. Against Stanford and its 3-4 defense, John Carlson lined up in the backfield as a fullback with Walker. The strategy paid off, as it resulted in the longest touchdown run in the Weis era. Finally, it's important to note that despite the fact that although many of the rushing yards came against bad teams like the Cardinal and the service academies, it's unfair to say that the play wasn't successful against quality defenses. Take a look for yourself. Last year saw Sprint 38/39 be called nearly exclusively from Half as a result of injuries and suspensions to Irish tight ends. All five of the plays not run from Half came against San Diego State. It would seem that Weis and Haywood wanted to run this play from as many formations and groupings as possible, but that opportunity quickly vanished. The biggest question mark has to be why the Irish couldn't run this play left behind Mike Turkovich and Eric Olsen, two of the best linemen on last year's squad. Also defying logic is the fact that Weis and Haywood continued to call Sprint 39, as though they expected a different result. It's beyond belief that a run averaging less than two yards per carry was called as often or more than it was in previous years, when it was three to four times as productive. For all the talk of Weis and his self-scouting, this one boggles the mind. Consider that at the bye week juncture, Sprint 39 had been called 11 times in games. Four of those carries were stuffed for no gain or behind the line of scrimmage. The longest run was just six yards, and only two other times did it pick up more than three yards. Quite simply, the staff needed to delete this play during the bye week, but yet they stubbornly ran it ten more times, picking up 18 yards in the process (15 on three attempts versus Navy). Here are some of those lowlights. On the bright side, only once was one of these plays called in the Hawaii Bowl, and it wasn't Sprint 39. Perhaps the extra prep time allowed Weis to sit back and finally see its flaws. Whereas the previous play is run to the strongside, this outside zone play is run to the weakside of the formation. It has been run with three wide receivers every single time except once, with James Aldridge in 2006 (which makes me wonder if the freshman erred), and it has been run both toward and away from the slot receiver. Most of the time, though, it's run away from the slot receiver. The numbers suggest that it could be the most productive run in the Irish playbook. Oddly enough, back in 2005 Sprint 36/37 Gut was called three times against Michigan, one of the better defenses faced all year. Despite its effectiveness, it showed up just twice more that season and never after the Purdue contest. However, it has been a staple of the offense ever since the 2006 season. Looking in the rear view mirror, one of the few times it didn't work in 2008 was one of the costliest-- 2nd and Goal from the Pitt 3-yard line in overtime. Prior to that play, the Irish had run three straight strongside stretch plays, and then Weis tried to trick Pitt by calling the weakside version. That play and other highlights are below. Notice, too, that most of the unsuccessful plays in these clips occur when the weakside run is also called to the boundary side. The last outside zone play used by the Irish is a strongside outside zone with a fullback, whose responsibility is to block whomever is out on the perimeter; in the diagram to the right, the safety. Meanwhile, the halfback does not have to follow him around the edge; he is free to find the daylight in the zone blocking and cut up inside. The play's heyday came in 2005, when it was run 25 times from three different personnel groupings, including Two Tites (2 TEs, WR, HB, FB) and Goal Line (3 TEs, HB, FB). Although it is used in normal situations, it is a staple of the goal line rushing attack. To put the Goal Line carries in perspective, twice the Irish scored a touchdown and a third time they picked up the first down. Rather than focus on the yards per carry average, it's probably more accurate to say that 60% of the time were the Irish successful. The play's usage was cut drastically in 2006, likely on account of Asaph Schwapp's knee injury. That year it was used five times in short yardage situations, where it worked only twice, and a sixth carry inside the redzone on first and ten was stuffed for no gain. In 2008, the Irish began the season by using the play twice a game against San Diego State, Michigan, and Michigan State. After the staff traded in "pound it" for "spread it" against Purdue, Stanford, and North Carolina, the Irish tried it twice more against Washington before shelving it. It returned one last time for the USC game, where it ironically picked up its longest gain of the year against the nation's best defense. That run, in addition to a few others, can be seen below. For the season, it averaged 5.2 yards per carry (with a median of 3.5 yards) on eight carries with Regular personnel and was perfect (two tries, two touchdowns) with Goal Line personnel (both against Michigan). Despite the desire to understand the problems of this play, I'd be out of my element to analyze the specific fundamentals of outside zone blocking and critique how the halfbacks have been coached to read the blocking and pick a hole. I'd rather defer to those who have played and coached offensive line to read their insights. Nonetheless, the research has left me with some additional thoughts and questions heading into 2009. Before he was working for the Irish, Jon Tenuta once said that one of his goals in designing and practicing defensive gameplans was to take away first the opponent's favorite running plays. Because the Irish couldn't run Sprint 38/39 from a variety of formations (due to their tight end issues), did that make it easier for defenses to prepare during the week to defend it? Last year James Aldridge typically played halfback in Regular instead of Armando Allen or Robert Hughes; was his lack of vision or footspeed (or something else) a reason why we didn't call Sprint 38/39 Boss more often? Did its scarcity also contribute to the perception that playcalling was often predictable based on personnel? Zone blocking requires so much communication, and the Irish are likely entering 2009 with only Young returning at the same spot. Can Verducci get the line to gel quickly enough? It would appear logical to expect improvement given the returning talent and Verducci's background as a "technician." But why does it seem like a matter of faith rather than logic? It was a blast from the past this weekend with Lou Holtz on the Notre Dame sideline, Tony Rice lining up under center, and the interlocking ND on the uniform sleeves. Taking the barnstorming idea to the extreme and resurrecting the idea of an ND All-Star team, the Notre Dame Legends team faced off against Japan National Team in the Toyko Dome in the 2009 Notre Dame Japan Bowl. The Fightin' Alumni Irish won 19-3, giving Lou wins on three different continents. You can watch the replay of the game on August 10th on CBS College Sports (formerly CSTV) and here is the official recap of the game. Former player Derek Curry even put up two videos on youtube about the game. But thanks to the international readership of BGS, long time contributor Nate provided BGS with his own personal recap of the Notre Dame Japan Bowl experience. An excerpt is included below, but make sure to check out Nate's entire recap here. Nate also provided some excellent youtube videos for those who can't wait two weeks for the broadcast and has a photo gallery with some great shots from the pre and post game parties. Saturday morning we took the kids and Mom-in-law out to lunch prior to heading to the Tokyo Dome for the game. We’d seen an NFL preseason game at the Dome a few years ago—Indianapolis vs. Atlanta, with Manning and Vick at QB’s, and I wondered how the crowd would compare. Would Japanese people, even football fans, care about a game against Notre Dame? Would the Japanese National Team be any good? Would they be TOO good, and kill our team of old-timers? The questions weighed on our minds, but the excitement of getting to see ND football overmatched anything else. Amy and I hopped the subway to the Tokyo Dome, and were pleasantly surprised when we got there. The crowd was fairly large for a sport that your average Japanese knows NOTHING about; many Japanese people were in Irish gear: the “Shirt”, Brady Quinn jerseys, and all manner of ND-logo’d apparel. Of course, many were simply football fans getting a taste of what American football was all about, so you saw Farve, McNabb, Brady, and all manner of NFL/other team jerseys as well. As we’d seen at the NFL preseason game, Japanese football fans are a passionate, knowledgeable bunch, precisely because the sport is so unknown in Japan—for them to learn, they have to teach themselves. They really don’t have the chance to be a casual fan, so for every fan who could barely tell the ND team from the Japanese team, there were fans who could diagram a Cover 2 and understood the spread variables the Japanese team ran. Interesting, to say the least. We made our way up to the VIP section, where we were presented with game programs and game jerseys from the ND team. Amy chose #3, a nod to Joe Montana and our hopes for Michael Floyd this year, and I chose #5, hoping I can pull Armando Allen through a 1000 yard season, and because my freshman year Ajani Sanders, an ND Safety who wore #5, lived on my floor in Morrissey. We found our balcony seats on the 50 yard line and settled in. 50 yard line sounds great, until you remember that the Tokyo Dome is a baseball stadium—the 50 yard line is the furthest point from the actual field. It was a decent view, but just far enough away to cause our camera to have some problems (apologies right now for the graininess in some of the pics). GAMETIME! First, the Japan National Team took the field, in their red jerseys and white helmets. The crowd and their cheerleaders were appropriately enthusiastic, but everyone was really waiting for those Golden Helmets to come streaming out. When the ND team was announced, and the Irish took the field, the smaller American section, filled with player families, expats, and military stationed here, erupted in cheers. Seeing the players stream on the field got me pumped and choked up all at once, I’ll admit. The team captains met at midfield for the coin toss, which Japan won; Japan elected to receive, and the game began. The Japanese took the kick, and got a decent runback to about the 30, I think. And promptly called timeout. Huh? Amy and I looked at her—was Bob Davie coaching the Japanese team? Would this be an indication of their level of play? Of course, to Japan’s credit, there’s was an all-star team of both professional and college players, ranging in age from 20 to 34. For those not familiar with Japanese football, Japan has two leagues: a professional league made up of teams sponsored by corporations, and a college league where most of the major universities compete against each other. Each year the champions of the two leagues compete against each other in the “Rice Bowl”, Japan’s version of the Super Bowl. Could you imagine the Gators winning the NC, and their reward is to play against the Pittsburgh Steelers after the Super Bowl? Crazy, but there doesn’t seem to be too much of a gap between the college and pro levels here in Japan. I’ve seen a Japanese exhibition game featuring players from one prefecture (Japan’s version of a state) playing those from another prefecture, kind of like the Florida-Georgia high school all-star game, and the level of play was…well…they seemed to have fun. It was somewhere around lower high-school level. But the Japanese National team was the best of what they had, and their coaching staff wasn’t a bunch of slouches. They’ve obviously done a lot of work studying the US game, and the spread attack they employed allows their smaller but quick players to get the ball in space and make the most of what they have. I don’t know if any teams in the Japanese leagues play smash-mouth football, but with only 1 300lb’er on the whole team, Japan wasn’t going to grind it out against the Irish. Notre Dame’s “Legends” team, on the other hand, ranged in age from 23 (Thomas Bemenderfer, the most recent graduate) to 52 year old Kris Haines and 51 year old Joe Restic. The average Irish player was around 30. Quarterback, Tony Rice, just turned 42. While it was obvious that the actual Notre Dame team of any year would destroy the Japanese team, the collection of volunteer players Coach Holtz assembled was a bunch of players from different eras, different systems, and I’m sure different levels of fitness. Sure, they had tryouts, and I’m sure they all worked really hard to get back to “playing shape”, but many of the team hadn’t hit anyone in a long time. The younger, fittest players were by definition not the best players from their time, as they aren’t on NFL rosters. I don’t say that to disparage them at all—they played their hearts out, but when Ambrose Wooden would start and play most of the game at quarterback, and Brandon Hoyte is the starting full back (yes, you read that correctly, Irish fans), it shows that you’re at the mercy of who is willing and able to volunteer when you put together the roster. Rather than anything negative, I’m extremely impressed with and grateful to the players who volunteered their time and energy to coming over here and playing a game. None of them got paid, nor did the coaches. It’s truly remarkable that this many former players and coaches would give up not only a week in Japan, but all the time spent practicing leading up to it, in order to strap it on one last time for Our Lady. Truly inspiring. First, the shameless plug. The nice people at "Here Come the Irish", which hits newsstands this week, allowed me to write a couple of features for this year's edition. One of them, a labor of love, was an oral history of Notre Dame in the Seventies compiled from conversations with, among others, Ted Robinson, Rudy Ruettiger and John Swarbrick. Many great anecdotes emerged, but perhaps my favorite comes from Rudy, with whom I have quite a history. When his movie premiered in New York City back in 1993, I was seated next to him. So the two of us go way back. Anyway, as I did with everyone I interviewed, I asked Rudy where he was during Notre Dame's epic hoops victory over UCLA in 1974 that snapped the Bruins' record 88-game win streak. Rudy being Rudy, he informs me that he was seated right on the court itself. "In fact," Rudy said, "if you look at the cover of Sports Illustrated the following week you'll see that I'm right between Bill Walton's legs. I once had a speaking engagement with Walton and I said, 'Hey, Bill, you and I made the cover of Sports Illustrated once." This intrigued me. I worked at SI. I worked on a special edition of SI once devoted to nothing but the history of the SI cover. And I'd never heard that Rudy had ever made the cover. And now, thanks to the internet, Rudy's assertion could be fact-checked in a matter of minutes. What followed was a series of hilarious and intriguing discoveries. First, that arguably the most famous regular-season college basketball game of all time did not, in fact, make the cover of SI. Why not? Because the editors of SI had already slotted the annual swimsuit issue (featuring perhaps the last only moderately hot model, Ann Simonton) to run that week. As current Clemson associate A.D. Tim Bourret, who was the Bookstore Basketball commissioner for three years in that era told me, "You never saw 8,000 college-aged guys so angry to receive the swimsuit issue in the mail." So, what? Was this yet another incident of Rudy's blarney? Actually, no. Rudy simply got the game and the year wrong. Being the unofficial N.D. historian that he is, Bourret, an old and dear friend, recalled that the previous year's UCLA-Notre Dame basketball game in South Bend had made the cover. Why? Because it was the Bruins' 61st consecutive win, which broke the existing record set by the University of San Francisco. A few minutes and a few clicks on the internet later, I did indeed find the cover to which Rudy was referring. And here it is. That's Bill Walton skying for the board (that may be Keith, later Jamaal, Wilkes next to him) and if you look below, there in the striped shirt with a mop of black hair is none other than Daniel "Rudy" Ruettiger. Twenty years before the outside world had ever heard of him, Rudy made the cover of Sports Illustrated. There was only one last problem. Rudy enrolled at Notre Dame a full year after this photo was taken. What was he doing so close to the court in one of the biggest games of that season when he wasn't even a student at either school? I caught up with Rudy just today--he was boarding a flight to Newark--and he clarified it all: " I had a job to sweep the court at halftime of the basketball games," he told me. But you weren't even a Notre Dame student yet, I replied. "I know," he said, "I was still at Holy Cross. But it was part of my arrangement to live in the apartment in the A.C.C. Heck, I was even on the Notre Dame student government when I was at Holy Cross before they found out and kicked me off." What was your role?, I wondered. "I was chairman of the Social Committee," he replied. I'm too tired to investigate that one, but would it surprise you? No running play has epitomized the finesse-oriented ground game of 2005 and 2006 like the draw play. Designed to look like a pass is imminent, the draw is a way to fool opposing defenses rather than to impose one's will through merciless and constant hammering in the trenches. And during last August, when Charlie Weis uttered the infamous phrase from which this series of posts derives its name, how many fans truly believed that the draw, the ideal complement to a passing offense, would play second fiddle? It actually happened. Last year Charlie Weis and Mike Haywood abandoned the draw play as the centerpiece of the rushing offense in favor of trying to pound the ball more, even if the overall attempt was an inconsistent and unsuccessful ground attack. As the table above illustrates, draw plays were down from the offense's banner years of '05 and '06. In fact, the very series of runs that finished at the top of the playcall sheet for both those years fell to just third place, ahead of only the Toss and the Jab. In this attempt to break down the draw plays in the Irish offense, we will categorize draws into three types: one back draw plays with the quarterback under center; two back draw plays with the quarterback under center; and last, shotgun draw plays. This is a one back draw that is typically run with three wide receivers. (Another type of draw, H44/45 is similar but utilizes two tight ends. It was rarely seen last year for obvious reasons.) It seems pretty straightforward, although from time to time, if a lineman is uncovered, he will pull around like in the diagram to the right. Most of these runs have been called to the right side, and draws to the left are marked by a distinct pivot by the quarterback before delivering the hand-off. In the clips below, which highlight the longest runs from 2005 and 2006, one can't help but notice how many times the interior blocking breaks down and Darius Walker is forced to bounce it outside. Who made these plays successful, the offensive line or Walker? In quite a few of those clips, especially when the defense wasn't blitzing, Brady Quinn's initial dropback froze the linebackers and gave linemen just enough time to get to the second level to make their block. At the same time, it's easy to see why this was a run that catered to Walker's vision. He got the ball deep in the hole, the linebackers were typically further away from the line of scrimmage, and he had a choice of holes to choose from. Further, as you can see from the table below, when Walker's more experienced offensive linemen like Mark Levoir and Dan Stevenson moved on, the play was less successful, although dropping to a 5.2 yards per play average isn't terribly worrisome. Last year saw the fewest rushing attempts and the worst average. And after watching the following clips, its drop-off in production and usage seems understandable. The backs in these clips rarely get a clean shot through a hole, and if they do have an opening, the linemen appear to be flailing around the second level, hopelessly trying to sustain blocks on linebackers. Robert Hughes ran that play eight times and picked up a measly ten yards all of last year. Most of his carries looked like the plays in that clip. But by contrast, check out Armando Allen below. Allen toted the ball 12 times, producing 80 yards with a 6.7 yards per carry average and a median carry of 5 yards. Secondly, compare Hawaii's defensive fronts in the clips above to those seen below. Far more advantageous when linebackers are deeper and not aligned on the line of scrimmage. The next Irish draw play incorporates two backs, with the fullback leading the halfback through a hole. An example can be seen in the diagram to the right. Another common version of this play - seen in 2005 and 2006 - had the tight end motion into the backfield as a fullback. You might recall that Joseph Fauria did this a few times in the spring game with much success. And as you watch the clips from several years ago, notice how rarely on these highlights that Walker is forced to bounce the run outside because of shoddy blocking. Whereas quite a few of the H 40/41 plays were successful because of Walker bouncing them and outrunning the defense to the sideline, here the offensive line blocking is more responsible for success on these runs. Somewhat surprisingly, this draw play was actually more successful in 2008 than in previous years. Looking back, Walker always seemed to run better without a fullback, when he was free to pick and choose his holes rather than follow a blocker, so that could explain the modest average in 2005. The dip below four yards per carry in 2006 was probably at least partially attributable to Asaph Schwapp's season-ending injury against Penn State. If there was one play where Schwapp seemed to excel, this was it. In terms of 2008, there is no better way to describe the Irish improvement than to simply show some clips. The ones below, taken from the same two games as the earlier clips, and with the same halfback who averaged 1.3 yards per carry on the other draw play, make the Irish look like an entirely different team. Watch all the linemen and Dan Wenger, in particular. By the way, amazing read and tackle by the Hawaii defensive end on that first draw. If he doesn't make that play, Hughes would have picked up 15+ yards easily. But getting back to the point, the Irish offensive line certainly seemed more comfortable running these plays, especially Wenger, who effortlessly moved off combo blocks to seal off middle linebackers. The last set of draws to examine are the plays from shotgun formations, which I've decided to group together even if they are designed to hit different holes (or could even be labeled as H 40/41). Despite the diminished role of the draw in the overall Irish offense, one cannot help but notice the dramatic jump in draw plays from shotgun formations in 2008. In all but three games, the Irish ran no more than one draw play from shotgun formations. Against Pitt, it appeared as though the Irish saw something in film study, as they opened with a specific shotgun formation and draw play not seen that much all year. They ran that play six times in the first quarter alone and picked up 41 yards. Two other times they called it as well. Against Boston College, they ran four, and those were the result of an inefficient offense stuck in third and long situations. Ditto the two at Michigan State. The use of H 42/43 Ace will be wholly dependent upon the staff's ability to develop a fullback. No competent fullback will likely mean more draws with three receivers (H 40/41) or two tight ends (H 44/45). For the sake of diversifying the offense and making it less predictable, somebody needs to emerge at fullback. Draw play usage, as a percentage of the offense, will increase. It's just impossible to see a scenario where teams can afford to put seven in the box against the Irish passing attack. ND will face many six man fronts as a result. Weis will then take what the defense gives him and call more runs, including draws. Armando Allen will remind fans of Darius Walker, and what he lacks in vision he makes up for in speed and lack of fear. He's not afraid to lower a shoulder into a defender rather than make an additional cut to avoid the contact. If the Irish win, and if the overall ground game improves, few will care that the draw play is a bigger facet of the offense. But if the draw is one of the only running plays that consistently works, history may repeat itself come January 2010. And that's just not good enough. The latest issue of Here Come the Irish has hit the newstands and Maple Street Press decided to once again let BGS chip in. Writers from NDNation, UHND, Classic Ground, Dr. Saturday, Football Outsiders, the Dean of Local Sports, Jeff Jeffers himself, and many more also have contributed to this year's version of the most in-depth pre-season annual you'll find. Many of you have picked up the Annual in previous years so I'll skip the hard sell and just direct you to the Maple Street Press site, where you can find a full table of contents and the all-important order information. Apropos of the recent posts here about scheduling, I thought I'd excerpt Brian Fremeau's excellent article about ND's scheduling: past, present, and future. For those who don't know, Brian is an ND grad and writer for Football Outsiders, one of the best number-crunching football sites out there. Here's a brief glimpse of Brian writing about ND's strength of schedule using his own methodology and hints that the strength of schedule for 2009 might not be as bad as some might think. The trends in Table 4 are more plainly apparent. Notre Dame hasn’t played a particularly top-loaded slate since the early ’90s. 2009 marks the third year out of the last four in which only two teams with at least a Very Good APP rating appear on the schedule. Only three teams from the Elite-21 power list in Table 2 will play ND in 2009, and two of them, Michigan and Washington, are experiencing program rating nadirs themselves. Is this a crisis? One thing to consider before answering that question definitively is the overall decline in scheduling philosophy on a national scale over the last decade or so. In 1997, only 38 games between FBS and FCS games were played, equivalent to 5.9% of scheduled non-bowl games among major college football teams. In 2008, 87 FBS vs. FCS games were played (11.3% of scheduled games). Appalachian State didn’t exactly usher in an era of parity when it defeated Michigan in 2007, either. FBS vs. FCS games are almost always slam dunks, and have been that way forever. Since 2003, FBS teams with only two wins or fewer to their name are still 51-10 against FCS competition. When more and more programs are electing to grab an “automatic” victory, is Notre Dame appropriately following suit by playing fewer “heavyweights”? Consider also that the 2009 schedule, as weak as it is projected to be, still rates as stronger than 20 of the 25 schedules played by No. 1 programs since 1985. That includes each of the last five seasons in which USC has held the mantle. Part of the reason for that, of course, is that in the head-to-head match-up, Notre Dame gets credit for facing an Elite opponent in the Trojans, whereas USC only gets credit for playing an Above Average opponent in the Irish. Still, if USC had played a program of its own APP caliber in place of Notre Dame since 2005, its SOS ratings would fall to around 0.12, similar to ND’s ratings over the same time period. It's articles like that, along with an expanded roster preview section and plenty of great insight from some passionate ND fans that will help fill up these next few weeks separating us from the greatest time of the year: college football season. Only days after the TCU rumor surfaced, it sounds like it is getting batted down. TCU likely won't add Notre Dame to its 2010 schedule, according to a source familiar with the situation. Despite reports that Notre Dame was looking to add both TCU and Tulsa to its 2010 slate, TCU's schedule is already booked and probably won't change. The brief article does float the possibility of ND playing TCU in 2011 or 2012, but it sure sounds like ND still has one game to fill on the 2010 schedule assuming the Tulsa game is a go. TCU did confirm talking with ND about a potential game, but didn't make it sound like too much progress was made. A TCU release stated: "We’ve had dialogue with Notre Dame just like we’ve had with many other schools regarding a possible future game." With Swarbrick mentioning that he would like to have the 2010 schedule finalized before the start of the 2009 season, more concrete reports about the final 2010 opponent should hit the wire in the next month or so. ND has played Army 22 of the 24 times it played in the old Yankees Stadium. Notable matchups included the famous "Win One for the Gipper" game in 1928, as well as the 0-0 tie in 1946 which featured three eventual Heisman Tropy winners. The series may not be so competitive lately, but for fans of tradition, the choice of opponent given this famous venue is an easy one. "Any student of Notre Dame football history knows the meaning of the Notre Dame-Army rivalry and, in particular, the history of that rivalry at Yankee Stadium," said Notre Dame athletics director Jack Swarbrick. "It's fitting that a Notre Dame-Army game will be the first football event in this fabulous facility -- and it's also fitting that the 50th meeting in this great rivalry will take place in a venue with such great tradition for both programs." The announcement was a whole-day affair, with Army coach Rich Ellerson and Charlie, Jr. throwing out the first pitch at that afternoon's home game. 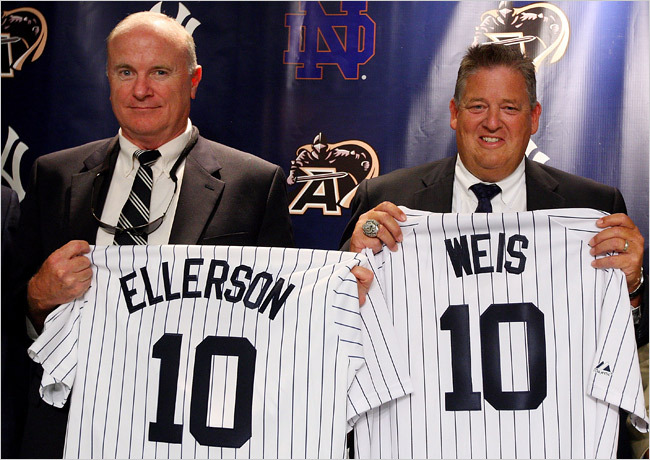 As the picture in the upper right shows, Ellerson and Weis got commemorative Yankees jerseys, a gesture that echoes Babe Ruth putting on an ND jersey some 82 years ago. In addition, more games in Yankee Stadium for future seasons were announced. Assuming the first handful go off well, it wouldn't be a surprise to see ND return to New York in the future for more games at the new Yankees Stadium. While on the topic of 2010 games, more rumors started to swirl about the last two open slots on the 2010 schedule. With not much time left and many teams already done filling out their dance cards, the latest internet scuttlebutt has ND lining up games against Texas Christian and Tulsa. So far, the only official comments have been about the Tulsa game, which seems like it's basically a done deal at this point. As reported Monday on tulsaworld.com , TU is close to finalizing a deal with Notre Dame for an Oct. 30 game at South Bend, Ind. "The two universities are in discussions to play football in the 2010 season," said Don Tomkalski, TU associate athletic director for communications. "No contract has been signed." Assuming that the Golden Hurricane takes the pre-Halloween spot, that leaves October 16th and November 6th still open for the Irish. TCU might take one of those spots, preferably for ND the latter (colder and gives ND the bye week in the middle of the season). Up front, I'll say that nothing is wrong with ND playing TCU or Tulsa. Both teams were in the Top 25 at some point last season, with TCU finishing the year in the Top 10. TCU had the #1 defense in the country last year and Tulsa has had the #1 offense in the country the last two seasons. They certainly aren't as bad as a handful of BCS conference teams. As a bit of trivia, Tulsa is the hometown of some familiar-sounding ND donor families like LaFortune, Warren, and Seigfried. And TCU is a private, religious institution, similar to BYU and Baylor. I have no problem with ND playing games against such universities now and again. But when looked at in context with the rest of ND's 2010 schedule, the combination of these games leave much to be desired from ND schedule-wise. Look at the second half of the season, leading up to the November 27th season finale at Southern Cal. That's five straight games against non-BCS conference teams. True, TCU and Utah finished the 2008 season in the Top 10 and could very well be highly ranked when they travel to South Bend. But let's look at the bigger picture. The 2010 home game slate would feature Purdue, Michigan, Stanford, Pittsburgh, Tulsa, Utah, and possibily TCU. For Notre Dame fans, that's not too appetizing. To be clear, this isn't so much of looking down our nose at a Tulsa or TCU as much as wondering where all big name (home) games are. Like nearly every single ND fan, I don't want 12 straight games against the elites of the gridiron, but if you threw in a Texas or Wisconsin or Georgia alongside the Tulsas and TCUs then the whole picture changes. There are still the rumors that ND is trying to line up more name opponents, but until one is officially scheduled, it's fair to question if and when it will happen as long as ND continues to try and make the 7-4-1 schedule model work. For the second time this summer, a cornerback from Florida made the trip to South Bend to announce his public commitment to Notre Dame. This time it was Cape Coral native Spencer Boyd who on Friday announced his intentions to become the 13th member of the 2010 recruiting class. You can see a brief clip of his announcement here. Youtube has highlights of his injury-shortened junior year as well as some clips of him playing running back his sophomore year. Showing off his running back skills and continuing the trend in this year's recruiting class, Boyd won MVP honors at a National Underclassmen Combine in Miami, Florida in 2oo8. Like Lo Wood and possibly Chris Badger, Boyd is planning on enrolling early, meaning all three curent DB recruits could be on campus for spring practice in 2010. Speaking of 2010, here's the 2010 cornerback position depth chart. Wood and Boyd solidify the corner position with ND looking to perhaps land one more in this class. Now that there are 13 recruits in this class, perhaps it's time to look at the overall numbers. This table will include all 5th year players eligible (Ryan Burkhart, Barry Gallup, Leonard Gordon, Paddy Mullen, Chris Stewart, Kallen Wade, Darrin Walls, and Dan Wenger) even though not all of them will likely wind up back on campus. With 78 scholarships accounted for and the limit still set at 85, that leaves 7 more available scholarships in this recruiting class for a grand total of 20. When additional attrition inevitably strikes, be it injury, ResLife, or transfer, there will be room for a few more. Odds are, by the time Signing Day rolls around, ND will have room for 23-25 players in the 2010 recruiting class, giving ND around 10-12 more open slots. With Boyd looking to join a few classmates in early enrollment, then he would technically count towards last year's class and ND could go over the 25-man limit in this class should there be a hefty amount of attrition. Either way, look for ND to have room for at least 10 more recruits in the 2010 recruiting class. After taking on the Toss Play in the first installment of "Impound It," we now turn our attention to the set of misdirection plays known as the Jab series. This family of runs shares the distinctive ball-handling of the quarterback. He opens to one direction with the ball extended, then turns quickly and hands the ball off to the tailback heading in the opposite direction. Similarly, the tailback takes a step in one direction, then quickly cuts back to receive the hand-off. Jab runs were called 41 times (13.3%) by the Irish in 2008, and we'll take a look at two of them below. However, one note of caution before we proceed. These running plays, as well as the ones to be analyzed in future posts, can be harder to classify because of nuances in blocking schemes. Possessing only a partial Patriots/Notre Dame playbook leaves chance for error. This play, seen to the right, is a weakside counter play. The halfback reads from inside out, meaning he starts with the first covered lineman to the playside. The fullback's responsibility is to block the last man on the line of scrimmage. Linemen just fire out and hit the guy in front of them-- this is not a zone blocking scheme. Jab 32/33 Bend appears to have been used most in 2005, when it was called 28 times. It averaged 7.0 yards to the left and 5.6 to the right; the Irish ran it left just about two-thirds of the time. It was also spread out amongst three different personnel groupings: Regular (HB, FB, TE, WR, WR); Detroit (HB, TE, TE, WR, WR), and Two Tites (HB, FB, TE, TE, WR). In addition, it was a very common play at the end of games when the Irish wanted to wear down an opponent. The following year, it was used about half as often, just 15 times. Knee injuries to Asaph Schwapp and John Carlson likely contributed to that decline in use. Again the run worked extremely well to the left, averaging over 8 yards per carry to the left, and again it was run to that side two-thirds of the time. When run right, the graduation of Mark Levoir and Dan Stevenson were likely reasons for the average dropping below 4 yards per carry. In 2008, this run was seen primarily with Regular personnel, although it was also utilized with a second tight end early in the season. When Will Yeatman was suspended, that incarnation of the play disappeared from the call sheet. Like in previous years, it was also a common play for the back-ups (Jonas Gray, Steve Paskorz, et al.) to run in garbage time as the Irish tried to run out the clock. Performance in Regular looks mediocre until one breaks down the individual carries, where it becomes clear that Aldridge ran the ball with authority while Hughes struggled. Yet before one entirely dismisses Hughes for those woeful stats, keep in mind that all of the Detroit carries are his. Perhaps he works better alone than with a fullback in front of him, although these two runs against Stanford from 2007 suggest otherwise. Notice this third run is the same play but with Yeatman replacing Schwapp. Two primary differences exist between Jab 32/33 Bend and this run. First, it's always run to the strongside of the formation. Next, as you can see from the diagram to the right, the backside guard pulls and takes on a linebacker. It's almost exclusively run from formations with three wide receivers, which places a lot of pressure on a defense because if they cheat a linebacker or defensive back into the box to support the run, that opens up the passing game. On the other hand, choosing to keep just six men in the box obviously makes running the ball that much easier. Every now and then it'll be run with two tight ends, although to be honest, those seem to be against smaller, outmatched fronts like Navy's. In terms of playcalling history, the Irish dialed up this run 16 times in 2005 and averaged 4.4 yards per carry. Only twice was it run to the left, so it's quite likely that pulling was not one of right guard Dan Stevenson's strengths. Then again, Stevenson pulled on other plays, like tosses, so there might be something unique with this play that caused it to be run almost exclusively behind Dan Santucci. Also of note is that Darius Walker was tackled in the backfield on one out of every five carries. The following year its use doubled. Because the more athletic Santucci became a full-time starter, the Irish called it 20 times to the right and 10 times to the left (behind Bob Morton's pull). Results were outstanding as it averaged 6.3 yards per carry to the right and 8.0 yards per carry to the left. Not once in 2006 was it stopped behind the line of scrimmage, and only once was it stuffed for no gain. Last year, Jab 36/37 was called just six times, but four of those runs picked up ten yards or more. In fact, it averaged 9.7 yards per carry, and the median carry was 12 yards. Twice it was called against North Carolina, once against Pitt in overtime, and then three times in the bowl game. All six plays are below. So why wasn't it called more often? Your guess is as good as mine, but it's hard to fathom that the staff didn't have a legitimate reason. Although some might point to our guards' athleticism and talent at pulling, it is also worth noting that, according to the playbook, there are more offensive line calls to make depending upon the defensive front that is faced. In other words, it seems to require more communication than other runs. That could explain why the bulk of these carries occurred in the bowl game, when the Irish could have spent more time practicing it. Will the other strongside counter, Jab 32/33, return to gameplans? That run showed up twice, against Michigan and Stanford, and then took a sabbatical for the rest of 2008. It was a much bigger part of the Irish offense in 2005 and 2006. Along those lines,will the addition of another running play make the Irish offense more efficient and less predictable? Similarly, will the return of Mike Ragone allow for the Irish to become more varied and less predictable in who-- and how-- they line up to run these plays? Who is going to play fullback, and if it's Aldridge, will the Irish still run Jab 32/33 Bend? Can the tailback/fullback hybrid block a defensive end, and if not, will personnel substitutions make playcalling more predictable? Will Jab 36/37 find its way into more games than just the three of 2008? The Jab series has important implications in terms of the overall ground game. At the same time, it's also proven to be one of the most dangerous play action passes in the arsenal. (Here's a tease.) But play action is meaningless if the ground game doesn't earn the defense's respect. As the questions outlined above clearly suggest, the entire Irish offensive coaching staff, not just Frank Verducci, has their work cut out for them. Chris Brown of Smart Football has penned an illuminating overview of Nevada's "Pistol" formation, with video and analysis that should provide a helpful addition or supplement to our earlier overview of the Irish's first 2009 opponent. My take on the Pistol in general, as well as the veer explained in detail at the end of Smart Football's writeup, remains the same: crash it. Stay in your lanes, remember your keys, but move -- make them pay for that split second lost on the fake handoff. ND should have one of the ten-best secondaries in the country this year. Until proven otherwise, trust the back three or four to stop Nevada's relatively inefficient (54% completion rate in 2008) passing game, then use ND's presumably superior front seven/eight athletes to pressure and neutralize Kaepernick's rushing game. Note on the title of this entry: I sifted through countless Nirvana and Pearl Jam references for a groan-inducing title to the Washington preview. Found Dead In the Greenhouse, while evocative, seemed in poor taste. Young Former USC Coach Behind the Counter in a Big Town was too long and detached from the original Pearl Jam track. A Google search for "TV shows about Jake" produced the eventual winner. John Stamos played Jake, and the show was eventually pulled in favor of Bachelor re-runs. While new coach Steve Sarkisian may eventually lead a Trista-and-Ryan charmed life in Seattle, roses are not in the program's immediate future. Steve Sarkisian, like his former USC co-offensive coordinator Lane Kiffin, has imported some Trojan coaching staples to Seattle. Sark has brought in a top-flight former USC defensive coach (Nick Holt), turned the Twitter volume to 11, and generally injected the Husky program with Carroll-esque optimism and energy. However, Coach Sarkisian was not able to load all of Heritage Hall into the moving van. Traveler didn't make the trip. Neither did Keith Rivers, Matt Leinart, Carson Palmer, Dwayne Jarrett, Steve Smith, Mike Williams, Rey Maualuga, Brian Cushing, Dominique Bird, Winston Justice, Ryan Kalil, Sam Baker, Reggie Bush, LenDale White, Mark Sanchez, Jeff Byers, Stanley Havili, Taylor Mays, Joe McKnight, Everson Griffen, or Ronald Johnson. In short, Sarkisian has gone from a program that has "settled" for throttling Big Ten teams in the Rose Bowl every January 1st to one whose former coach was proud to play Hawaii in December. In a regular season game. That they lost. The cupboard is not entirely empty. Lest anyone forget, Jake Locker returns at quarterback. The obligatory Jake Locker compliments feel similar to telling someone from a bottom-tier academic school that they "have a great nursing program." While true -- Locker is a talented athlete and a seemingly likeable kid -- the point feels a bit empty and condescending given the context. The context is this: Washington has been terrible. Washington might become excellent during the Sarkisian Era. With access to junior college players, they could be good reasonably soon. But they will not be good this year. I do not think Notre Dame should or will lose a home game against this team. With the conclusion out of the way early, let's take a closer look at the 2009 Washington Huskies. The team starts with the nursing program. Locker, the dual-threat Bellingham, Washington native, was Willingham's recruiting pearl, albeit one who dreamed of Montlake since childhood. Locker has been star-crossed since arriving at Washington. His 1,000-yard rushing campaign as a redshirt freshman was cut a game short, with an injury against Oregon State, and he missed most of last season after breaking his thumb in the fourth game, against Stanford. He has also played for a team that has won nine games in three seasons. Still, if Sarkisian's pro-style system and Locker mesh, and/or Sarkisian adapts to the speedy quarterback, Locker might finally emerge and enjoy his finest year. The other blue-chippers on offense are redshirt freshman running back Chris Polk (also injured last year) and two tight ends, sophomores Kavario Middleton and Chris Izbicki. Polk was Scout.com's 9th-rated running back in the class of 2008, with offers from USC, Cal, and Oregon, and he should be the nominal starter heading into the fall. However, he will likely share carries with some or all of Demetrius Bronson, Willie Griffin, Brandon Johnson, and/or David Freeman. Middleton and Izbicki should split time. At wide receiver, D'Andre Goodwin returns from a 721-yard campaign. Jermaine Kearse, a former four-star recruit who saw limited playing time as a true freshman, should also start. Devin Aguilar, who also played as a true freshman, Cody Bruns, Vince Taylor, and Anthony Boyle round out the receivers. Washington's 2008 offensive line was even worse than Notre Dame's. Washington averaged just under 100 rushing yards per game last year and yielded 31 sacks. The good news for Husky fans is that two starters graduated. Some attention has focused on the big guys' weight. Though right guard Senio Kelemete and right tackle Drew Schaefer both weigh in at less than 280, the rest of the group -- particularly 335 pound left guard Ben Ossai -- is anything but svelte. Perhaps they just need assistance re-distributing that weight. Learning how to block could also come in handy. Defense should be the way the Huskies first announce their return. New coordinator Nick Holt led the already legendary USC defense last year, and no reasonable observer questions the value he brings to the Washington staff. Every 2008 starting defensive lineman and linebacker returns. Top tacklers Mason Foster (outside linebacker), Daniel Te'o-Nesheim (defensive end), and Donald Butler (inside linebacker) are back, as is outside linebacker EJ Savannah, who had left the team before last season. Sophomore Quinton Richardson returns at corner, along with Matt Mosley and Justin Glenn, and safeties Nate Williams, Johri Fogerson, and Greg Walker. Special teams could doom the Huskies in any close games. Neither their kicker nor punter have played Division I football. Punter Will Mahan is a Juco transfer, while kicker Eric Folk did not play in his first two seasons at Washington. Their return game is also unsettled, although Polk could become involved in that capacity. After an 11-37 run under Tyrone Willingham -- which featured, among other ignominies, the retention of just 17 total players from the combined 2005 and 2006 recruiting classes -- at least Washington fans finally have hope. Wins may not come early. Washington opens against LSU, and USC visits on September 19th. If Sarkisian can keep morale intact, his experienced defense might pull off a surprise at some point this season. Just not on October 3rd.